With another holiday season behind us, we would like to take a moment to look back at an important program that our team here at BluJay Solutions is happy to support. Since 2013, we have sponsored Globe Santa, an organization that provides holiday presents to families in need in the Greater Boston area, a community where many of our employees live and work. Globe Santa began in 1956 to help deliver the magic of the holiday season to children in families that otherwise go without during the holiday season. In its first year, Globe Santa raised $51,000 in donations to provide 6,200 Boston families with gifts. Throughout the years, the love and support for this charity has grown, as over three million children have been given gifts during the past six decades. BluJay’s involvement with Globe Santa started four years ago when we donated our Parcel software solution to help create a smoother process for the charity. 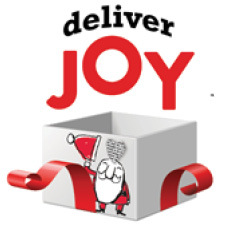 Each year, we continue to provide the maintenance for Parcel solution, and we are thrilled to support Globe Santa’s mission to deliver joy to local children around the holidays. Globe Santa’s strength has always been the good will of the community, and we are more than happy to help such a beautiful tradition. Each holiday season, we look forward to lending a hand in creating a Christmas that these families will never forget. Founded in 1956, Globe Santa is the signature holiday gift-giving program of the Boston Globe Foundation. This unique program verifies family need and delivers customized packages filled with award-winning books, educational games, toys, warm winter gear, and school supplies directly to children in homes throughout 190 cities and towns across Greater Boston during the holiday season. “BluJay Solutions gives Globe Santa an important leg up in meeting the demands of delivering gifts to those most in need in our communities. The shipping solution reduces costs and enables Globe Santa to customize our reporting to meet the demands of delivering nearly 20,000 parcels in a very short four-week window,” says Connolly. There are several ways to make Globe Santa a part of your other holiday traditions, and if you are interested in making a major impact on the lives of young children in the Boston area, you can visit Globesanta.org.